So in addition to bringing back “blove”, I’ve also decided to commit to a few other series – both old and new. “Dinner IRL” will now be a regular monthly feature. I’ve gotten SO many positive comments on this series, which doesn’t surprise me. That search for yet another good, interesting, EASY meal – that doesn’t require the use of every pot and pan in the house – is never ending, and I feel it too. And while I’ve posted a bunch of vegan recipes in the past – both here and elsewhere – I’ve decided to make it a regular feature as well. I’ve received many comments and e-mails expressing appreciation for my vegan recipes. And the interesting thing is, a lot of these readers are not vegan. Some are allergic to dairy. Others to eggs. And I’ve heard from people who need to avoid butter and milk for religious reasons (in traditional Jewish cooking, dairy and meat cannot mix, and dairy-free desserts can be a challenge to execute well). Take a peek at my vegan Pinterest board for all my past recipes; here’s a brand new one that I’m super excited about! One of the hottest ingredients this past year is something coined “aquafaba”. Yes, that liquid that you discard when draining a can of chickpeas turns out to be a pitch-perfect substitute for egg whites, in everything from buttercream, to marshmallows, to whiskey sours. It whips up exactly like regular egg whites and doesn’t smell (or taste) like chickpeas at all. 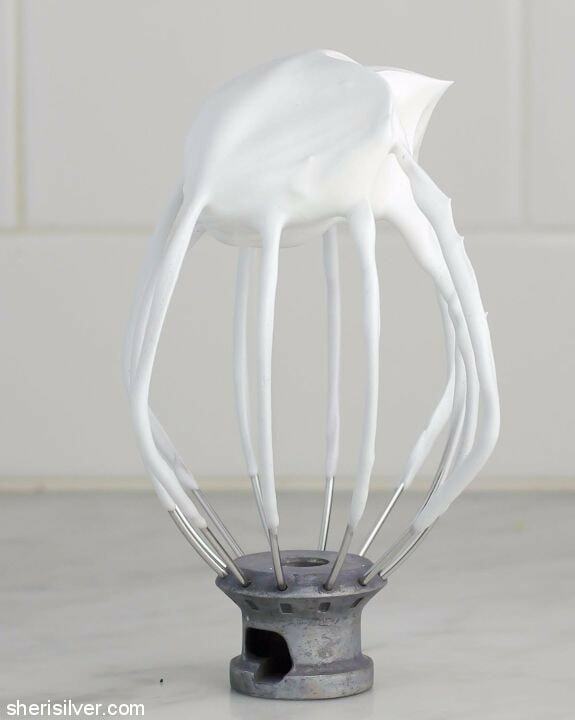 You can read more about aquafaba in this article on Bon Appetit’s site – along with some great ideas for how to use it. 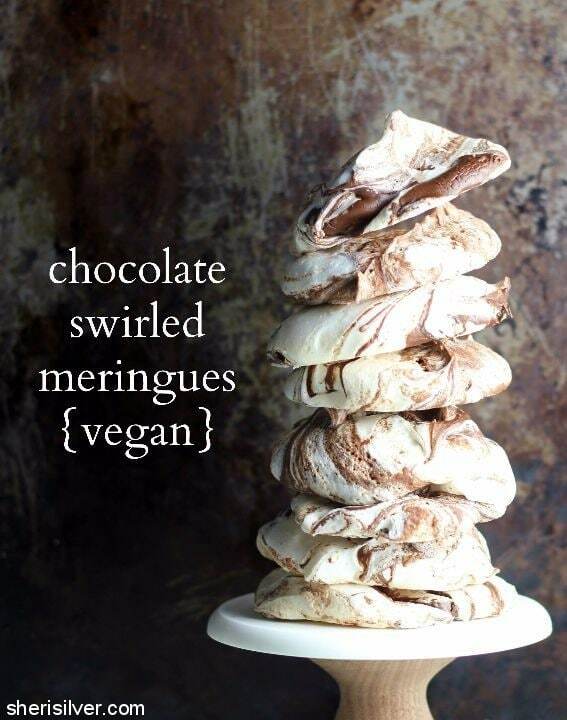 I thought it would be fun to make some meringue cookies, swirled with chocolate. Can you believe these are 100% egg- and dairy-free? And they’re pretty foolproof too. 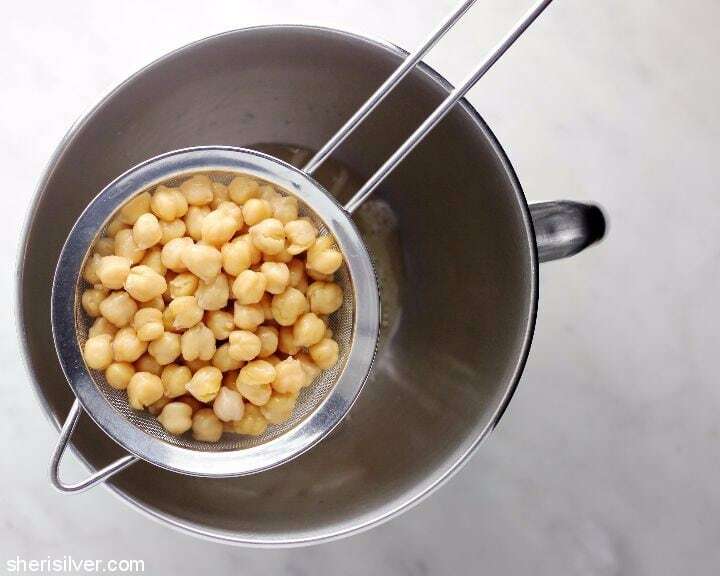 Drain the liquid from the chickpeas into the bowl of your mixer (reserve the chickpeas for another use). Using the whisk attachment, beat at high speed for 5 minutes. Gradually add the sugar, followed by the cream of tartar and vanilla. Continue beating till stiff peaks form, about 3 – 5 more minutes. Drizzle the melted chocolate over the top and use a large spoon to make a few swoops through the meringue (don’t overdo). 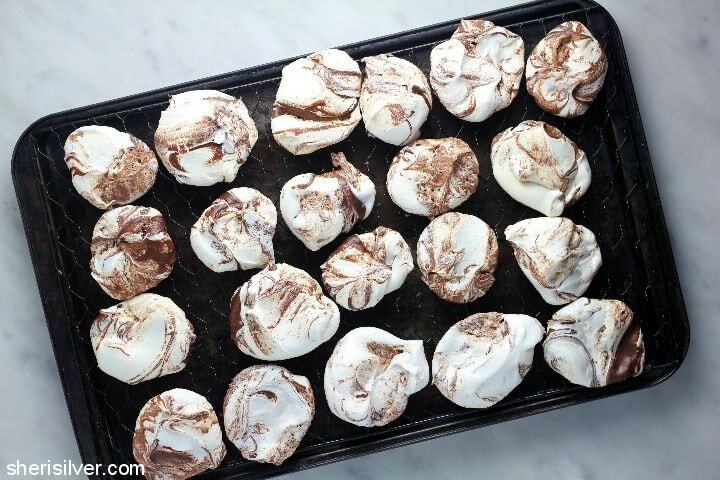 Scoop the meringue in spoonfuls onto your prepared baking sheets and bake – switching the pans about halfway through – for 2 – 3 hours, or till completely dry to the touch. Turn oven off, open the door slightly, and leave trays in for another hour. 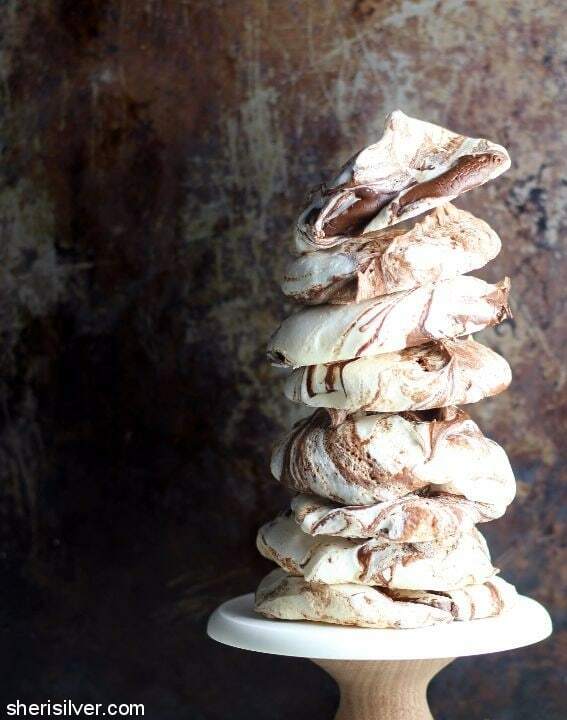 When cooled, store in an airtight container at room temperature (meringues will start to lose their crispness in a few days – depending on the humidity – but are still completely delicious). Do you heat the oven to 200 degrees Celsius or Fahrenheit? Hi, I made them yesterday and teywere a total fail – what went wrong? Off course I meant: they were! Oh no! How did they fail? They didn’t like the oven…. OMG!! I just made these and they turned out PERFECT! I didn’t have vegan chocolate so I used a couple of tablespoons of cocoa powder with water added until it had the consistency of melted chocolate. It worked like a charm! Fantastic, pretty little cookies! Can’t wait to try all kinds of variations! I tried using Aquafina for meringue and it had a horrible after-taste. Does it matter what type of canned chickpeas are used? Or is that after-taste always there? I’d say that it depends on the person as well as the recipe – the more flavors you add to the base, the less noticeable the chickpea flavor will be. With chocolate by far being the best “mask”. The one time I made just plain meringues I definitely noticed that “bean-y” flavor!